Padma Balakumar a Young and Charming Dancer has blossomed into the Artistic Director, Teacher and Founder of the Nrityagriha School of Dance of Indian Classical Dance today. She was initiated into Bharatanatyam at the young age of 7 in Chennai and had her very successful Arangetram (debut solo programme) at the age of 12. Padma Balakumar was trained in this classical art under the guidance and tutelage of guru Mrs. Malathi Srinivasan a senior disciple of Smt. Rukmani Devi and the first student and assistant to the dance maestro “Natyakalachakravarthi” “Padmashree” K.N.Dhandayuthapani Pillai (KND). Padma has thus imbibed from her guru the Kalakshetra tradition blending it with the KND school of stylisation. Padma had the opportunity to improve her abhinaya and choreography through her association with Ms Lakshmi Viswanathan in many of her productions including her film ‘The Poetry of dance’ for the Festival of India. Padma received professional training in nattuvangam from the esteemed and well respected Narasimhacharis. 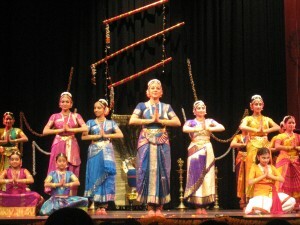 After her Arungetram, Padma, continued to perform in all the prestigious sabhas in Madras. All her performances received good reviews and were commended by the press and the cognoscenti. Padma moved to Sydney in 1989 where she has continued to perform for various community organisations and produced various thematic dance presentations such as “Pancha Bhakthi and Krishnaleelamrutham”. Padma’s dedication to teaching and practice of Dance saw her establish the Nrityagriha School of Indian Classical Dance in Sydney in 1989. Padma has trained a number of first generation Australians and now has a good group of dedicated senior and junior bharathanatyam students. Many of her students have performed for fund raising events, community functions and charity organisations. Nrityagriha School of Dance is proud to have several senior students who have completed their Arungetram and continue their journey in dance under the care and guidance of Padma as their Guru. Padma today strives to continue with her commitment to dance in addition to her other duties and commitments as an IT Business Analyst. Your email has been forwarded to the Dance School directly and they will respond to you shortly. Do you take bharatnatyam classes for kids aged 3-4 years? what is the fee structure? pls. give me ur contact details.